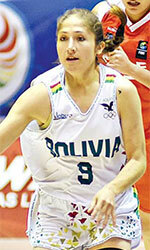 LF2 newcomer Mataro Parc Dori Dori Boet tabbed 26-year old Bolivian international point guard Romina Rodriguez (167-92). 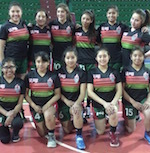 She played in the summer at San Simon in Bolivian Libobasquet. Rodriguez has played there for the last three years. She also represented Bolivia at the ODESUR Games in Cochabamba (Bolivia) this year. Rodriguez has played also professionally in Argentina (Villa Belgrano), Colombia (Catolica) and Bolivia (Univalle and Nonis Santa Cruz). After a full year without a pro league, Bolivia's Women's basketball is back with the 2018 edition of Libobasquet, a league that started on March 9th with 5 franchises in competition, including Carl A-Z Oruro, Club de Tenis La Paz, San Simon, EJ Plaza and Aleman. The tournament will be played in 2 rounds and the championship will last a couple of months with a single group of 5 teams playing each other. The top 4 teams will advance to the second stage at a neutral location for a Final Four and the top team will represent Bolivia in the South American League. Three foreign players per team will be allowed but only 2 can play at the same time on court. San Simon is the current title holder (2016) and Aleman was the runner up. Both teams are based in Cochabamba and Quillacollo. Carl A-Z and Aleman are based in Oruro and the only team from the capital city is Club de Tenis. Carl A-Z, coached by Marcelo Mendieta , hired American Amber Holt (183-SG-85, college: Middle Tenn.St.) and Cuban Dairis Tornell (176-PG-92) as their foreign players. The team also hired national talents Laura Florida, Silvana Tejeda (179-F-86), Nicole Rojas and Esther Pacheco (183-F/C-82). Meanwhile, San Simon's coach is Sandro Patino . The young and renewed team includes Marcela Viscarra (169-F/G-90), Isabel Bruno, Romina Rodriguez (167-PG-92), Jhoselin De La Barra, Jhenny Rocha, Vannia Vargas, Gabriela Herbas, Victoria Olguin, Genesis Rivas, Melisa Rios, Rebeca Rios, Estefani Terrazas and Shirley Jaldin. Aleman, coached by Willman Flores, opted to signed veteran Guatemalan Sonia Vasquez (182-F-83), a player of its country's National Team. The roster includes Blanca Aldana and Carla Cruz.